It is on Hunters Land Road (County Rte. 10), 1/10 mile east of the junction with Rapp Road (County Rte. 12). 105 yards on trail behind large sugar maple just beyond steep hill sign (next 1 1/2 miles). 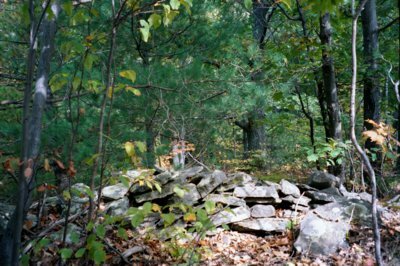 The small, abandoned, Clyne Family Burying Ground has a handful of graves surrounded by a stone wall perched above a shale pit. There are two children´s unmarked graves, each encircled by a ring of field stones, probably dating from the 1820's or 30's. We need someone to give us GPS coordinates.